I am addressing it to the both of you because after reading what Scott wrote, I figure it should be to the both of you since you are essentially the halves to a whole! I have only been through just a few of Scott’s blog posts and I have gotten chills every time. The way he talks and explains your love has just been so beautiful and well written I feel like I am in the middle of it all. But the thing that got me was the first line to his Blog Post when he mentions the word Anam Cara. I will tell you a story. In high school my friend Jasmine invited me and another one of our group to attend her grandfather’s Wedding just so she had someone to talk to during the reception. And from what I found out during the “wedding” was that her grandparents were never “officially” married. That before he left for war, they didn’t have money at all but he knew from the moment he met her that she was the one he was going to be with. That there was an instant connection, that spark. He was young, barely 18 and she was a year younger. They met through friends about 3 weeks before he was to ship out for the war. I can’t remember the whole thing but they spent every waking moment together and behind their parents back they had their friends perform a binding ceremony or something. Where they tie ribbons around bound hands and promised that they would be together. Long story short he shipped off. They had two intertwined ribbons. One was pink and one was blue. He took the pink to remind him of her and vice versa. They wrote to each other every day. He kept her ribbon with him at all times as she did with his. Sometimes he even felt he could hear her talk to him. They wrote back and forth to each other and there usually was a 1 month or more delay in letters. But for some reason the letters he received from her had the same exact phrasing of love and adoration that he had just written a few days before! I’m getting long winded. I’ll get to the point. Long story short your story so mimicked theirs, I had goose bumps. Anyway he got shot. He was lying in the field and no one was there to help him. He thought he was going to die. He pulled the ribbon out and held it and just pictured her face. THE SAME DAY (they only found out later when he went back home) in a journal entry she writes she woke up from a dead sleep with a sharp pain in her stomach (where he got shot) and she knew it was him. So she immediately got on her knees and just chanted his name over and over again telling him to hang on. She will get him help, he will be okay. HE HEARD HER! he swears he heard her. And he lived. Many years later they came to America. They never officially married but they were married in their hearts and many years later after many kids and some grand kids they got the papers to prove it. But I am not done. This hits a chord because what I remember him saying struck me so hard that day that I still remember it. He said that he knew that she was his soul mate the moment they saw each other that they were Anam Cara. and in Ireland the ribbons were meant to bind them together. But he said that since they were soulmates that they did not need ribbon to bind them. The ribbon was a tether so that they will always find each other. So that they had a line that if they were ever far, in time, in distance, in planes that they can find each other. no matter what. And I kinda figured that’s Scott and Lesley. There’s a tether around your souls so that no matter where, or when, or what time in your life, or what body you take (animal, human, or just a soul wandering) That there’s this invisible ribbon that will always be there so you can always find each other. Does that make sense? I hope so. I just want to say that what you guys have is special. and I’m sure you know it. I’m just happy for the both of you. Finding your person is so rare. And finding your someone through lifetimes and distances shows your souls perserverance to be together no matter what. Something that everyone wishes they will find, if not this lifetime but the next! And Lesley I am sure you know it, but Scott is a great guy. A hard worker, a jack of all trades, and he tells the truth no matter what and thats a hard thing to say in this day and age. He is always tough but most importantly he is always fair. But when he talks about you. You can see the toughness melt away and not in a bad way. In the way that you know he is someone truly in love. So here is to the purest of love!!! I’m gonna drink a toast for you two and a wish for myself to find someone who will love me half as much as you two love each other! In other words, Althea “gets it.” I wrote that last line only partly in jest. It is not far fetched to believe that could be true, considering Althea’s extreme sensitivity to, and rare and accurate pereception of my and Twinklebear’s Twin Flame relationship. It takes someone on a higher spiritual plane, to be awakened, to the reality of the Twin Flame phenomenon. Very early in our relationship, Twinklebear and I quite by accident, came across some writing eerily descriptive of what Twinklebear and I had: an unusually close and intimate relationship, which developed extremely rapidly. Too rapidly to be a garden variety mutual attraction, and too intense to be mere infatuation. “Anam Cara means ‘Soul Friend.’ Anam is the Gaelic word for soul and Cara is the word for friend. In Celtic tradition, an Anam Cara is a ultra-close soulmate you can share your innermost self with, to reveal the hidden intimacies of your life, your mind and your heart. This friendship cuts across all convention to create an act of recognition and belonging that joins souls in an ancient and eternal way. In this relationship, you are understood as you are, without mask or pretension. When you are understood, you are at home. Love is the threshold where the divine and human ebb and flow, one into the other. Love is the most real and creative form of human presence. An expression of human consciousness, this love includes a depth of awareness and reverence for presence. Where consciousness is dulled, distant or blind, the presence grows faint and vanishes. Therefore awareness which brings integration and healing, is one of the greatest gifts of this friendship. As a result, you look, and see, and understand differently. You refine your sensibility and transform your way of being in the world. After twinklebear and I read more of such literature, we exclaimed, “My God, that’s us!” Anam Cara literature describes two soulmates who are seemingly “made for each,” enjoying an exclusivity with each other, that separates them from “ordinary” spouses, or spouses who are “soulmates.” Keep in mind that not all maried people are soulmates to each other. Spouses who are soulmates, share much with each other. Anam Cara on the other hand, share everything with each other. And I mean everything. 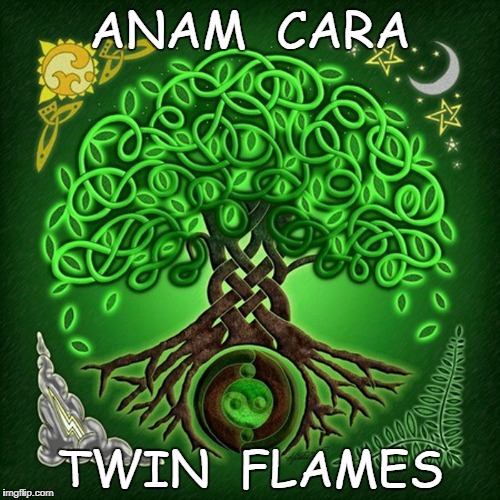 Anam Cara share a level of extreme intimacy, that is frankly uncomfortable for people who are not Anam Cara (or “Twin Flames”). Here is how Twinklebear and I have changed each other. Or I should say, this is how we are different with each other, compared to how we each were with other romantic partners in our lives. Quiet simply, we were just normal spouses with others. I don’t say “normal” derogatoricaly. All “normal” people are just a little bit, to a lot guarded. It is as a matter of reality, a human trait that preserves self-integrity. Most people don’t feel totally comfortable with sharing anything and everything with their spouses. If people are honest, they will admit to themselves, that they hold back to some degree, from their spouses. People are hard-wired to be this way, for self-preservation. One of the incredible realizations that Twinklebear and I came to, was that we could not be guarded, even in the slightest degree with each other. As our Twin Flame status—or as we called ourselves, Anam Cara—became abundantly apparent to us, we were compelled by our very closeness–to change, to become totally, unabashedly, uninhibitedly open with each other. It was such a revelation! It was a revelation, and it was liberating. To be open—is to be free! Free from the constricting necessity of holding back, which is the normal condition between humans who are not Anam Cara or Twin Flames. Converesly, seeking homeostasis in an Anam Cara or Twin Flame relationship, is to strive toward total openness and intimacy. Which is what Twinkle what and I have done. Are these two separate phenomena? I don’t know. I can only tell you that Twin Flames is more specific, as to the origin (and therefore the bonding) of Twin Flames: God at the beginning of time, split precisely 72,000 souls into two, creating in the process, 144,000 “Twin Souls” who individually had perfect mates, the other halves of the single souls that God split in half. “AC” Twinklbear and I, “AC” Sookybear Wong, are each other’s Twin Flames and therefore, each other’s perfect mates. We have accepted the Twin Flames doctrine as truth, because we live it. However, we do hang onto the “AC” prefix, that stands for “Anam Cara.” That must mean something. Twinklebear and I, as Jasmime’s grandparents did not, need the ribbon to validate in some way, our Twin Flame connection. But they do represent. In our case, Twinklebear and I instead of ribbon, have our traditions that are unique to our Twin Flame situation. But….there are those ACs preceding our names. My sookybear , such a revelation and amazing coincidence ( or maybe not?) Althea’s friend , jasmine, having grandparents, whom are ” Anam Cara ” too. There is one more intriguing piece to this story ( now I am not kidding here! ) I get goosebumps , just to think of it. I ( as you know) have always been a very spiritual person, therefore, I believe in Angel’s, spirit guides, that type of genre. Well omg! Omg! Omg! AC sookybear, love of my existence, when I connected with one of my guides , many years ago, she came to me in a * Bright blue light , almost effervescent, and a royal blue * guess what her name was? Goosebumps again! Her name was ” JASMINE! ” I also at that time, brought white jasmine, for my garden, and Jasmine insence, for my home! Wow! There are no coincidences here my love , only more pieces , of our soul journey, falling into place. Also I would like to give a very special mention, to Althea, for being so understanding, and for sharing her experience. Which in itself, is another link , to mine and Scott’s journey. I believe Althea, had the ” Anam Cara ” experience for a reason, and that there is a reason, why, Althea, is also in our lives. My dearest AC Twinklebear Lesley Maclean! That “coincidence” regarding the name of your spirit guide from the past—Jasmine—is mind blowing. Of course by now, we no longer believe that there are numerous coincidences on our Twin Flame journey. All of this merging of avenues of commonality, seem by design, of a higher plane for sure. I love you my Baby, forever and a day. Twin Flames, Podmates, Bear Pact forever!